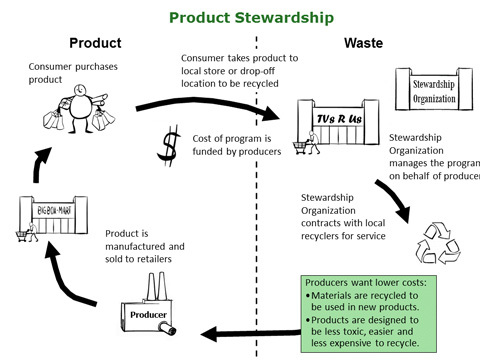 This map produced by the Product Stewardship Institute (PSI) includes EPR laws that require manufacturers to finance the costs of recycling or safe disposal of their products. It does not include other laws that contribute to the appropriate management of products, such as banning the sale or disposal of products containing toxic materials, requiring that consumers pay a deposit at time of purchase to be redeemed when they return the product or its container, requiring retailers to collect products, and calling for purchasing environmentally preferable products. EPR is a mandatory type of Product Stewardship in which manufacturers take primary financial responsibility for the post-consumer environmental, safety, and economic impacts of their products. When manufacturers are required, by law, to design, manufacture, and manage their products in environmentally responsible ways, the result will be products that are less toxic and less hazardous over the course of their lifecycles. Additionally, local taxpayers and governments will be relieved of financial and operational burdens of materials collection and management. Thus, there are two features of EPR policy: (1) shift financial and management responsibility (with government oversight) upstream to the manufacturer and away from the public sector; and (2) provide incentives to manufacturers to incorporate environmental considerations into the design of their products and packaging. Since we define EPR as a legislative approach, we believe it requires further clarification of the Principles of Extended Producer Responsibility. The following EPR Principles include key elements that should be included in all EPR legislation. Although these Principles will be applied differently by different jurisdictions, they are aspirational and considered best practice to achieve maximum results. Producers are required to design, manage, and finance programs for end-of-life management of their products and packaging as a condition of sale. These programs may or may not use existing collection and processing infrastructure. Programs should cover all products in a given category, including those from companies no longer in business and from companies that cannot be identified. All producers within a particular product category have the same requirements, whether they choose to meet them individually or jointly with other producers. Producers have flexibility to design the product management system to meet the performance goals established by government, with minimum government involvement. Producer-managed systems must follow the resource conservation hierarchy of reduce, reuse, recycle, and beneficially use, as appropriate. Products must be managed in a manner that is protective of human health and the environment. Producers design and implement public education programs to ensure achievement of performance goals and standards established by government. All consumers have convenient access to collection opportunities without charge. Government is responsible for ensuring that producer programs are transparent and accountable to the public. Producer programs, including their development and the fate of products managed, provide opportunity for input by all stakeholders. Government is responsible for ensuring a level playing field for all parties in the product value chain to maintain a competitive marketplace with open access to all, for setting and enforcing performance goals and standards, for supporting industry programs through procurement, and for helping educate the public. Retailers only sell brands within a covered product category that are made by producers participating in an industry program, and are responsible for providing information to consumers on how to access the programs. Consumers have a responsibility to reduce waste, reuse products, use take-back and other collection programs, and make appropriate purchasing decisions based on available information about product impacts and benefits. Manufacturers may choose to implement take-back programs on a voluntary basis. This program has diverted more than 85 million pounds of batteries and cell phones from the solid waste stream and established more than 34,000 collection sites throughout the U.S. and Canada. This program has diverted more than 195 million square feet of used ceiling tiles from landfills since 1999. Producers create products. Products are often designed to be thrown away, are difficult to recycle or they may contain toxic materials. Consumers buy and use products. When products are no longer neeed, they are disposed or recycled. Local governments are generally responsible for managing the garbage and recycling system. Residents pay a fee to their local public works agency for these services. Even though most local governments provide basic recycling services, many can’t afford to recycle the vast array of products that could be recycled or should be managed properly because they contain toxic materials (such as electronics or fluorescent light bulbs). Therefore many products - and valuable resources - get thrown away. In this system, a producer's responsibility ends when the product is sold. 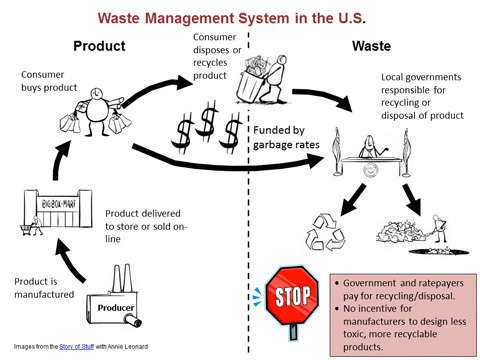 Product producers help create a system to recycle or properly dispose of their products. Producers contract with a “Stewardship Organization” to manage a program where consumers can “take back” their products to be recycled or properly disposed when they are done using them. The Stewardship Organization contracts with local collectors, recyclers and processors to provide the recycling service. The program is funded by passing on the cost of the service to the consumer. Local governments publicize the program to their residents. Consumers buy products and when we’re done using them, we bring them to the take back program at no additional charge. Producers are now involved in the system and have an incentive to make products that are more recyclable, less toxic and easier to return and/or reuse. Solutions to Product Stewardship issues can be approached in different ways. Some hard-to-handle wastes require an investment in infrastructure to effectively collect, sort and manage materials. Other materials are serviced by producer driven take-back programs to recapture value in products.